Stats are important in daily fantasy golf just like they’re important when analyzing stock prices (if you’re a financial analyst), predicting disease outbreaks (if you work for the CDC) or building bridges (if you’re a civil engineer). If you don’t know your numbers, you can’t do your job. The problem, at least in terms of competing in fantasy golf contests, is that a lot of the data you’ll come across doesn’t matter. They might provide a small bit of insight into player performance, but ultimately pose a big waste of time. You can literally spend all day crunching numbers and reviewing stats and have little to show for it when it’s time to build your lineups. Today, we’ll cover the numbers that really matter in daily fantasy golf. Our goal is to highlight the important stuff and ignore the rest, saving you time, effort and frustration. Play in a free Masters Golf contest at FantasyDraft or you can take a look at the new for this year DFS Golf Formats at Draftkings including 1 day events (instead of the traditional 4 day tourneys). This guide is designed to cover the stats that will actually help you to create a winning fantasy golf team. Grab a cup of tea (caffeine is optional, but recommended). Then, sit back and learn how to use a golfer’s past performance to predict his future fantasy point production. Let’s start with driving accuracy. This number isn’t as revealing as it might seem. Mathematically, it’s the result of dividing the number of drives that make the fairway by the number of attempted drives. You can already see the problem. “Accuracy” has a broad definition. A drive that ends up on the first cut is treated the same as a drive that gets lost in the trees. Of course, there’s a big difference between those 2 shots. A golfer can still make or beat par on the first one. But he’s unlikely to do the same with the second one. Every drive that fails to make the green imposes a cost. The cost varies by the number of shots needed afterwards to get within putting distance. I’ve made this statistic seems practically worthless from a research perspective. In truth, it’s not. Despite its shortcomings, it’s a good place to start. Scoring average is the result of dividing the total number of strokes by the number of played rounds. An amateur golfer who finishes at 85 would have a scoring average of 4.72 (85 divided by 18). A pro who finishes at 64 would have a scoring average of 3.56. Scoring average may seem to have limited use outside of predicting how a player will finish the day. But there’s insight to be had under the raw numbers. Consider: a lower average usually translates into a greater number of birdies and eagles. That means more points for your fantasy team. One way to make use of this stat is to look for golfers who have low salaries despite good scoring averages. A lot of the time, their low salaries stem from their taking breaks from the tour rather than turning in weak performances. This is arguably the most important number to track. It reflects the number of strokes needed to get on the green based on par. The ability to consistently hit greens in regulation is a good barometer of a golfer’s tendency to post birdies and eagles. It ignores the golfer’s putting game and chipping ability. Instead, the focus is on his (or her) drive. The first major obstacle faced by every golfer on the tour is whether he’ll make the cut line. The cut determines which players will advance into the weekend and earn a check. From a daily fantasy golf perspective, players with a low cut percentage – i.e. those who tend to miss the cut – should be avoided. You need golfers on your team who will go the entire 72 rounds. The more rounds they play, the more fantasy points they’ll earn. This number reflects the likelihood that a golfer will make birdies (1 stroke under par). Along with eagles, birdies are the currency of fantasy PGA contests. They’ll comprise the majority of your points, which means they have a huge influence on whether you cash. Identifying each golfer’s birdie percentage is a solid method for targeting productive players. Birdies do more than just generate per-round fantasy points. They also imply the golfer’s potential for finishing with a low score. If he’s hitting birdies on a large percentage of holes, he may end up leading the pack. A first-place win will deliver an additional 30 points to your team. This statistic is an extension of the birdie average (ref. above). You can calculate it by dividing the number of under-par rounds by the number of GIR (greens in regulation) rounds. Or you can just look it up on PGATour.com. 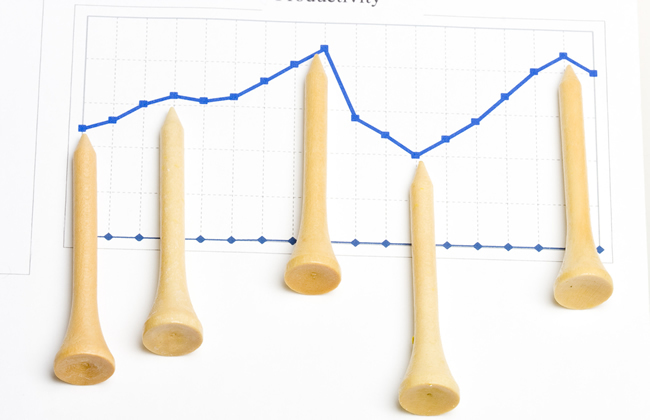 Why should you track a golfer’s birdie or better percentage? Because it’s an easy-to-use indicator of comparative performance. If a player has managed to maintain a high percentage for the year, you can feel confident he’ll produce for your squad. Sans a bout of food poisoning or a sudden back injury, there’s a good likelihood he’ll deliver birdie after birdie. Note that 3 in a row will earn you an extra 3 points at DraftKings. For some reason, putts are largely ignored by a lot of daily fantasy golf fans. Most folks focus on driving accuracy, driving distance, GIR and birdie average, forgetting that a poor putting game can ruin a great tee-to-green round. That’s a big oversight since the green is where a lot of understated (and undervalued) players rival the pros. First putt distance works in tandem with what are arguably the most important indicators of a golfer’s putting game: putts per round and the average distance of putts made. A golfer with a shorter average first putt distance, even if only by a foot, is more likely to sink the ball in a lesser number of strokes. A player’s bounce back percentage shows how often he scores under par right after hitting a bogey (1 stroke over par). A high percentage indicates he’s unlikely to be encumbered by poor rounds. He’s able to “bounce back” rather than letting his mistakes adversely affect his performance. Some golfers crumble after hitting a bogey. They can’t seem to shake it off. Others seem to be able to take their mistakes in stride and push forward. Obviously, you want to avoid the former and focus on the latter when building your daily fantasy golf lineups. Scrambling percentage reflects how often a player makes par or better despite missing greens in regulation. A golfer who ranks highly in this category might have a killer chipping or putting game that makes up for a lackluster tee-to-green. In other words, his short game helps him to avoid a bogey (or worse). A high scrambling percentage can compensate for a low driving accuracy percentage. A golfer who can chip and putt with consistent accuracy can be an asset for your squad even if he spends too much time in the fairway. And if his long game is solid, his high scrambling percentage in poor tee-to-green rounds might make him an ideal asset for your roster. Here, we’re taking the discussion slightly beyond golf statistics. You should have at least 2 players in your lineup who aren’t afraid of taking risks. They’re the ones who will chase birdies and eagles at the risk of hitting bogeys. That type of risk might seem ill-advised, even foolhardy. If one of your players hits a bogey, you’ll only lose half a point. That’s not a huge penalty. Meanwhile, if he scores a birdie or eagle, you’ll earn 3 or 8 points, respectively. Can you see how your team might benefit from golfers who are willing to take risks? Remember, birdies and eagles are how you’ll earn most of your fantasy points. Think of it this way: you’ll earn 30 points if one of your golfers finishes first. That’s a major accomplishment. But the number of points you’ll earn from a first-place finish is less than you’ll earn from just 2 eagles and 2 birdies. While conservative golfers might win tournaments, the risk-takers are the ones who tend to deliver the most fantasy points. Given the above, which stats should you use to identify risk-taking golfers? Golf statistics have taken on a life of their own. There’s far more number-crunching being done today than was the case a decade ago. It’s approaching the intensity of sabermetrics. On the one hand, knowing your numbers can give you a valuable edge over your competition at sites like DraftKings. On the other hand, you can waste a lot of time reviewing numbers and ratios that don’t much matter in terms of putting together lineups that help you to cash. If you’re short on time and need an efficient way to analyze golfers for your daily fantasy PGA lineups, stick to the stats we’ve covered above. They’re the ones that will make the biggest difference.